Emory students enjoy taking a study break with therapy dogs at Woodruff Library, a welcome relief from the stress of preparing for final exams. Back by popular demand, therapy dogs will return to Emory's Robert W. Woodruff Library for a study break on Friday, Dec. 5, from 10 a.m. to 4 p.m. in the Jones Room to help students relieve the stress of preparing for final exams. Students in groups of three spend 10 minutes with the dogs to break up the stress of studying for final exams and working on term papers. Canine Assistants of Milton, Georgia, will provide trained dogs for students to pet and play with. A non-profit organization, Canine Assistants provides service dogs to children and adults with physical disabilities such as seizure disorders or special needs. Since the dogs must be exposed to a variety of situations as part of their training, the study break with students at Emory gives them a chance to work in a different type of environment. Students in groups of three spend 10 minutes with the dogs to break up the stress of studying for final exams and working on term papers. Studies have shown that petting an animal can lower blood pressure and heart rate, reduce stress and ease tension. "One of the students last year said his doctor told him to decrease his anxiety by being around animals, and the student said he felt more relaxed after petting the dogs,” says visiting assistant English professor Tina Colvin, who was a study break volunteer last year when she was a Woodruff Library fellow. The library's Outreach and Education Services team plans special events each semester around final exam time to help students relieve study-related tension and anxiety. In the past, the team has held breaks centering on free food for students and the response has been enthusiastic. 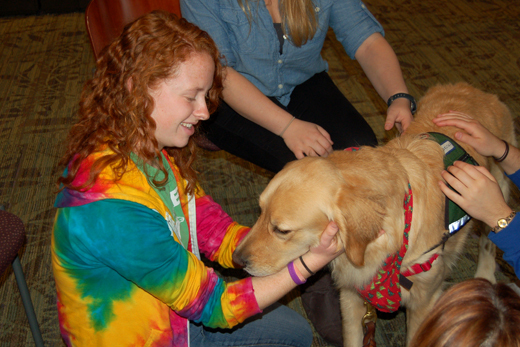 Last year an estimated 360 students attended the pet therapy event. While studying abroad last year, however, she did not have the same opportunity. “I was disappointed that the school I was at last fall did not have dogs for us to pet during finals, so I will definitely be taking advantage of the opportunity again this year,” Koven says. Students are advised to sign up in advance, but walk-ins are also welcome.